The MCB2140 board connects the ASC0 on-chip serial UART to the MAX563 (IC2), which converts the logic signals to RS-232 voltage levels. The ASC0 UART may be used in bootstrap mode to download other utilities for debugging or downloading flash. In addition to the standard 3-wire interface, the COM0 DB9 connector is wired to allow a board RESET via the DTR pin, and to enable In-System Programming (ISP) via the RTS pin as shown in the figure below. The Flash Magic Utility uses the DTR and RTS pins to control Flash downloading. You must install jumpers J1 and J10 to program Flash with this utility. 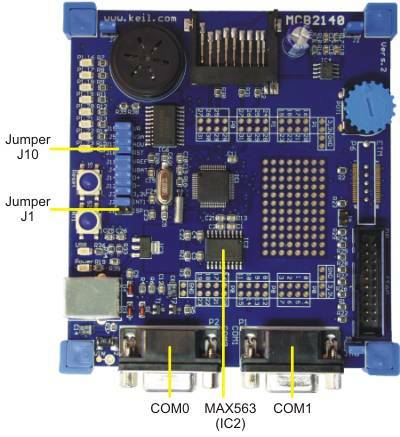 The COM1 DB9 connector uses the standard 3-wire interface and does not connect the DTR or RTS pins to any board component as shown in the figure below.